After inspecting the scatter plot the next step is to fit a model to describe the relationship. On the Analyse-it ribbon tab, in the Fit group, click Fit > Polynomial 2 - Quadratic. A 2nd order polynomial fit task is added to the analysis task pane. On the Analyse-it ribbon tab, in the Model group, click Test Effect of Model. The Effect of Model task is added to the analysis task pane. 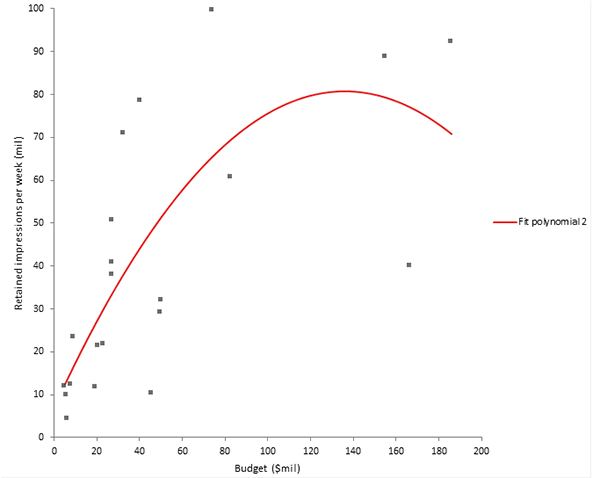 The regression line on the scatter plot shows the relationship described by the model. The effect of model table p-value of 0.0011 tells you that there is a statistically significant relationship between spend and yield.